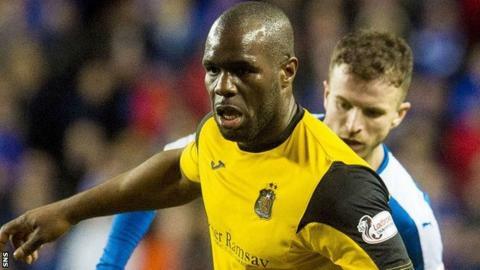 Christian Nade netted a brace as Dumbarton came from behind to beat Queen of the South and improve their chances of avoiding relegation. Nade tucked the ball beyond Robbie Thomson, but Queens were level when Iain Russell found the top corner. The visitors took the lead when Alex Harris slotted past Jamie Ewings. But, within two second-half minutes, Tom Walsh and Nade put the Sons ahead and Garry Fleming's penalty secured the win after a foul on Gregor Buchanan. The win lifts Dumbarton five points clear of second-bottom Livingston with a game in hand. Match ends, Dumbarton 4, Queen of the South 2. Second Half ends, Dumbarton 4, Queen of the South 2. Gary Oliver (Queen of the South) wins a free kick in the attacking half. Attempt missed. Mark Millar (Queen of the South) right footed shot from outside the box is too high from a direct free kick. Attempt missed. Mark Millar (Queen of the South) right footed shot from outside the box is high and wide to the right. Goal! Dumbarton 4, Queen of the South 2. Garry Fleming (Dumbarton) converts the penalty with a right footed shot to the bottom left corner. Penalty Dumbarton. Gregor Buchanan draws a foul in the penalty area. Penalty conceded by Andy Dowie (Queen of the South) after a foul in the penalty area. Corner, Dumbarton. Conceded by Andy Dowie. Dale Hilson (Queen of the South) is shown the yellow card. Attempt saved. Callum Tapping (Queen of the South) right footed shot from the centre of the box is saved in the centre of the goal. Substitution, Dumbarton. Scott Taggart replaces Jamie Lindsay. Substitution, Dumbarton. Paul Heffernan replaces Christian Nade. Substitution, Queen of the South. Lewis Kidd replaces Kyle Jacobs. Attempt saved. Frazer Wright (Dumbarton) header from the centre of the box is saved in the centre of the goal. Attempt saved. Tom Walsh (Dumbarton) right footed shot from the left side of the box is saved in the bottom left corner. Jon Routledge (Dumbarton) wins a free kick in the attacking half. Attempt saved. Steven Saunders (Dumbarton) right footed shot from the centre of the box is saved in the centre of the goal. Christian Nade (Dumbarton) wins a free kick in the attacking half. Substitution, Dumbarton. Grant Gallagher replaces Kevin Cawley. Corner, Queen of the South. Conceded by Jamie Lindsay. Christian Nade (Dumbarton) wins a free kick in the defensive half. Steven Saunders (Dumbarton) wins a free kick in the attacking half.